...A blend of 'Chicken Soup for the Soul', 'All I Really Need to Know I Learned in Kindergarten', western psychology, spirituality and Zen, with a little Obi Wan Kanobie and Yoda tossed in for good measure. host of the talk show "Insight"
Writing from his heart, Dr. Gettis gives you the benefit of his 30 years of treating emotional problems. He weaves the teachings of cognitive behavioral therapy with the wisdom of other healing traditions. 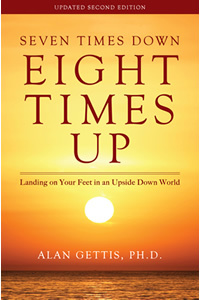 The result is a down-to-earth, highly readable yet profound self-help book. At times you'll laugh out loud. Other times you will be moved to tears. You will definitely learn how to think differently and feel much better. You will learn to be happier! For improved mental health, better coping skills, stress reduction, and a different way of experiencing the world. The profound insights will change forever the way you look at your life. author of "Self-Coaching: How to Heal Anxiety and Depression"
Dr. Gettis captures the essence of what it takes to live a happy, spiritually fulfilled life. author of "When Therapy Isn’t Enough"